Its the day of pranking everyone, the April Fools' Day. April 1 everywhere is a fun day getting all silliness out of people. It involves making fun and playing pranks on everyone. The day has become so popular that it is not limited to just people anymore. Search giant Google plays a prank on its users each year. Every year on April 1, Google introduces some new features to prank its users. And most of the people fall for its trick. Like Google, several other media platforms also join in by making up some news to fool the audiences. Google has been playing the April Fools' Day jokes since the year 2000. Best April Fools' Day 2019 Pranks: Unique and New Ideas to Trick Your Friends, Family or Colleagues on April 1. 2000: This was Google's first April Fools' Day hoax. It asked users to stare at an animated GIF and project a mental image of what they wanted to find in it. The results displayed several error messages later. These were funny messages asking users to rethink or silence the voices in the head. 2002: Google revealed the technology behind PageRank Systems- PigeonRank. It spoke about the trainability of domestic pigeon and how its capacity recognizes objects. The article made many humorous puns based on computer terminology and how the page ranking system actually works. 2004: Google announced a fictitious job opportunity on the moon. They claimed to have created a new operating system they claimed to have created for working at the research center. They announced it over Gmail and Hotmail. 2006: In 2006, Google created a parody online dating called Google Romance. It offered a soulmate search to the users and asked them to make a Google Romance profile. Once the users clicked on it, it gave error messages, some of which linked to April Fools' jokes. Here's a tour of the Google Romance Prank. 2007: Google announced a new service called Gmail Paper. It allowed users to e-mails to a 'Paper Archive' which Google would print and mail via traditional post. It was a free service announced with red adverts printed on the back of printed messages. 2008: On 1st of April, Google's blogging service Blogger featured an announcement for Google Weblogs, or "GWeblogs," or "Gblogs," as a new revolution in publishing. It listed a series of features and then asked the users to click on a video tour. On clicking on the video, it took the user on a clickbait video rickrolling, Rick Astley song Never Gonna Give You Up. gDay: Google announced gDay in Australia, a kind of beta search technology that searches web pages 24 hours before they are created. Gmail Custom Time: The new feature was announced which allowed users to 'pre-date' their messages and choose had an option to have the message appear as 'read' or 'unread'. Clicking on the link led to a 404 error page. Google Book Search Scratch and Sniff: This feature of Google Book Search asked users to place their nose near the monitor and then click on Go. It would then load odors to help them sniff certain books. But when the user promptly clicked on Help it redirected them to a page about the origin of April Fools' Day jokes. Google Calendar Feeling Lucky: Google added the "I'm Feeling Lucky" button to its calendar feature. Whenever a user created a new event,they were given the new option of 'I'm Feeling Lucky' which would set the user up with an evening date with stars like Matt Damon, Eric Cartman, Tom Cruise, Jessica Alba, Pamela Anderson, Paris Hilton, Angelina Jolie, and many others. Google Saturi Translate: Google introduced 'Google Saturi Translate'. Saturi is a Korean dialect. Whenever the user tried to translate a message, it explained that it was an April Fools' Day event. Google Talk: Google announced that it would shorten all conversations over Google Talk to reduce the carbon print. It called the initiative Google Talk Goes Green in honour of the Earth day. Virgle: Google in association with Virgin Group announced of a permanent human settlement on Mars in the next 20 years. It invited users through an application with a questionnaire. Yogurt: Google's social media application Orkut displayed its name as Yogurt. YouTube: It was the first time YouTube participated in Google's pranks. All the videos on YouTube UK and Australia linked to video of Rick Astley's song Never Gonna Give You Up, causing all users of the website who clicked on featured videos to be Rickrolled. 2009: On April 1, Google announced a new technology of "Cognitive Autoheuristic Distributed-Intelligence Entity". CADIE technology as it was called would help users to interpret the data obtained from each ball to provide useful tips to owners. Gmail Autopilot: Gmail was given a new feature called Gmail Autopilot which would analyse an email. The FAQ section mentioned this would "adjust tone, typo propensity, and preferred punctuation from the Autopilot tab under Settings." But once when a person logged in, the option wasn't there. gBall: Google Australia announced the newest football technology—"gBall" which would be used in the Australian Football League with GPS. Google chrome with 3D: A new version of Google Chrome was offered which rendered the pages in Anaglyph 3D which was powered by CADIE. It asked users to print glasses before enabling 3D browsing. Google Book Search: CADIE recommended some books to the users in the Google Book Search homepage. When the generate book report button was clicked it displayed a message, "Gotcha! It's April Fools' Day! Sorry, but you'll have to actually read the book yourself." Google Docs on Demand: Google Docs had a new feature to add subliminal messages and images to documents. But if a person made a new presentation, they would notice the option wasn't there. Google Mobile: Google Mobile got a fun link to Brain Search. There were instructions like Put phone on the forehead for brain indexing and asked a user to think about a query. The button changed to 'search me' and it displayed fake search results. 2010: On April 1, Google jokingly announced that it was changing its name to Topeka and even changed its name on the homepage to Topeka. This was in response to Topeka city's attention stunt to change its name to Google in the month of March same year. Topeka wanted to capture a spot in Google's new broadband/fiber-optics project. Google Docs storage: Google made an announcement that Google Docs will have the capacity to upload anything. It said it would also include physical objects like keys, remote controls, etc. The funny announcement also said that objects could be sent around the globe by "uploading" and "downloading" them. Search result units: The search results page displayed the time taken to load the results in different units. And in the units were many pop culture references. YouTube ASCII video filter: The YouTube logo was overlapped with ASCII text. The notice underneath the videos stated that watching the video in this quality helped to save USD 1. It also marked this 'new' feature as a way fo wishing the viewers Happy April Fool's Day. Animal Translator BETA: Google Animal Translator was added to the Language Translator Service. Users were asked to download an application for Android phones and it provided some amusing translations depending upon the animal selected. Evil Bit: Google added 'evil bit' to their AJAX APIs and it generated an appropriate response. When it was set to false option, the Google Search results for 'April Fools' encoded in JSON. Wave Wave Notifications: This feature said that users will have a human waving at them to notify the user. The person could select the volume of the human notifier from a list of silent, medium, loud and vibrate. The options in human included names Ashton Kutcher, Dr. Wave, Grandma, Werner Heisenberg, and Puppy. Clicking the page redirected them to Google help page, telling them it was an April Fools' joke. Disemvoweling on Gmail: The Gmail page including the Google logo was displayed without any vowels. On the page addressing the issue, they mentioned that it wasn't an issue but just an April Fools' prank. Life-sized Picasa: Google asked its users to print life-size cardboard cutouts of all their photos. Once the user clicked on the option it gave an error page. 2011: The video player YouTube added a button which would apply a video filter to the video and replace the audio with a recording of Rhapsody Rag. It was background music played in silent movies in 1911. Gmail Motion: This feature said that a body gesture oriented way could be used to send and view mail through Gmail. It said it would track the movements and translate them into meaningful commands. Upon clicking the 'Try Gmail Motion' button it explained that the feature does not exist. Google Docs Motion: It said that Google Docs Motion would introduce a new way to collaborate using your body. Documents, Spreadsheets, Presentations, Drawings, and Document List tools would involve using their body. Autocompleter Job: Google posted a YouTube video with a 'Google Autocompleter' explaining the job title. And they also posted a job for Autocompleter. On clicking the link, it opened results for google April Fools' Day pranks". Chromercise: Google Chrome launched a new website called Chromercise, with an aim to increase the hand strength of people to help them browse faster. They gave away free Google Chrome finger sweatbands. Google teleport: Google claimed it was a service which would allow users to time travel. The site was in simple Chinese and said the user will be the first one to journey through time and space. Search font Change: Searching for common fonts like 'helvetica', 'comic sans', or 'comic sans ms' temporarily changed the entire webpage's font to Comic Sans. Google Cow: The Google body homepage changed to Google cow. A cow's body was examined in 3D. Google Maps: The Google Maps displayed dragons, sharks, Loch Ness monster and reb lobster at specific locations. Contoso to Google: The Google Enterprise Blog announced that Contoso (a fictional company used by Microsoft in Microsoft's product documentation materials) was now acquired by Google Apps. The post made references to previous Google jokes. Meow Me Now Mobile: Google announced new mobile-based option to locate kittens around the user's location. Blogger: Although Blogger has been a part of Google since the year 2003, the company announced that blogging service was now part of Google. 2012: Google partnered with Square Enix and announced NES version of Google Maps service. Google also added a Quest layer to Maps website, which had 8-bit tile-based graphics and sprites on landmarks. YouTube Collection: YouTube added a small disc to its logo. When clicked on it opened a service called "The YouTube Collection". At the bottom of it had a fake shipping form and claimed the delivery date is in 2045 and in small letter displayed "Also, April Fools." Google Street Roo: Google made an announcement of releasing a force of more than 1000 big red kangaroos would capture up to 98% of the Australian bush within the next three years. These images would be used in the Google Street View. Chrome Multitask Mode: It said the user could browse the web with more than two mice at a time. The Multitask Mode button showed a fake mouse moving on the screen and on clicking the Exit button it revealed April Fools message. Elegantizr: A new code introduced by Google to insert in HTML. After using this code, every text would begin with April Fool and an emoticon. Gmail Tap: Gmail Tap doubles the typing speed for the new keyboard. On April 1, 2012 it did not allow anyone to download the app. It kept flashing retry messages and asked the user to check again on next April 1 after a few retries. Really Advanced Search: A new link called Really Advanced Search was displayed at the bottom of the search page. On clicking that option, it redirected users to search results for "April Fools". jargon-Bot for Google Apps: Google announced a Jargon-Bot supposed to recognise business terms and provides real-time, in-product jargon translation into plain English. At the end of the page, they asked the user to turn off the Jargon-off and avoid getting fooled. Google TV Click: This was called an innovative remote control application for phone and tablet. It let the user interact with shows and movies. Google Voice for Pets: Google said they have introduced a special Voice Communication Collars that fit around animal necks and it would directly record voice for animals. It was supposed to help understand animal language. Canine Staffing Team: Google said that all the dogs in their office go through the same detailed recruitment and hiring process by Canine Staffing Team as other human applicants. Google Analytics Interplanetary reports: Google Analytics announced that they are expanding beyond Earth and would provide information on visitors to the site from neighbouring sites and planets. Google Edible fiber: Google made a video stating their invention of an edible fiber which would provide feedback from the body, determine which nutrients are needed and target delivery to the specific organs that need those nutrients. It was a video promoting Google Fiber, an internet service provided by Google. 2013: On April 1, Google made an addition of "Add new awesome application" button which was immediately taken down on the next day. Google SCHMICK (Simple Complete House Makeover Internet Conversion Kit): This option allowed the user to redesign their street viewed house so that they can fly the Australian flag outside the house. Google Wallet Mobile ATM: Google announced the release of the Google Wallet Mobile ATM. It said to end the user's concern of finding the nearby ATM and would dispense cash immediately after its attached to the smartphones. Levity Algorithm: Google introduced the Levity Algorithm in some of its apps to help users spice up even the most boring of work days. Updated Export and Send-to Features on Analytics: The Google Analytics got some updates. The Export and Send-to features had options like 3.5" floppy, CD-ROM, papyrus, sticky note, carrier pigeon, fax, telegram. Self-Writing Code: Google announced they have developed a self-writing code program. They said now Google engineers had more time to collaborate and maintain a work-life balance. Google Nose: Google fooled people into believing that they could smell what people are searching through Google Nose. 2014: On April 1, Google created an entry in their careers page looking for a dogengineer. Nest + Virgin: Google teamed up with Virgin Airlines and made an ad announcing the latest in-flight feature. It said now passengers on Virgin Airlines aircraft could change their personal temperature on the plane using their latest Total Temperature Control technology. Emojifying the Web: Google Translate for Emoji was introduced which can help the reader to read all the web content "using efficient and emotive illustrations, instead of cumbersome text. "It spoke about emojis replacing characters and also improving efficiency. Upcoming Viral Video Trends: YouTube announced they were accepting viral video ideas from everyone. The user would write, shoot, and upload all of the world's most popular viral videos. AutoAwesome for Resumes: Google announced they would introduce special effects for Resumes on Google Drive. Coffee to Home: Google Fiber, the internet providing service announced Coffee to the Home (CTTH) program for Kansas City residents promising coffee drinks straight to users at fiber speeds, just like their internet speed. AdBirds: The Google AdWords team a new way to show ads called AdBirds. Users had six options like Sparrow, Duck, Owl, Pigeon, Eagle and Penguin) to choose from. 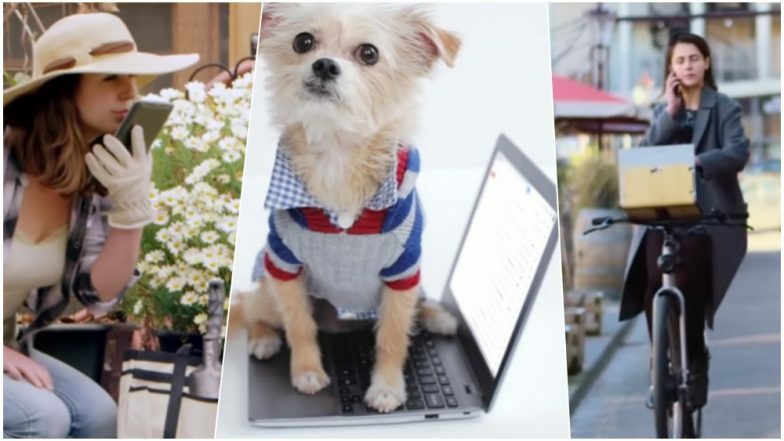 Google Apps for Business Dogs: Google announced a set of new features that would make Google Apps more useful for Dogs in the workplace. Features included Dmail with translation, Hangouts with Bark Enhancement, and paw recognition technology. Data-less Decision Making: Google announced a web course on making uninformed business decisions on a whim by following your gut instincts and how to apply simple guesswork techniques. Adsenses on planets and moon: Interplanetrary addresses were interpreted as said by Google. It would provide more information and reports to improve user engagement on your site. Chromecast for squirrels: Google announced it is developing 'paw-friendly' apps to build Chromecast support into more of the apps and websites both humans and squirrels love.2015: On April 1, Smartbox by Google Inbox was announced which would auto-sorting folders, push notifications, temperature control, spam protection and more. On Google 1, Google launched com.google, a version of Google Search in which the site is reflected horizontally. It was removed on the next day. Google Fiber Dial Up Mode: Google Fiber announced a dial up mode which would help slow down life to take care of little things. Darude- Sandstorm: If one searches many song-related searches on YouTube, it suggests Sandstorm by Darude. Google Panda: Google Search product manager announced the launching of Google Panda, a panda plush toy aimed to 'change the face' of Google Search. Equator Slipping: Google Maps engineers from Sydney Office 'discovered' that the Earth's equator was slipping south at a rate of 25 km per year. 2016: On April 1, a new feature called Mic Drop was added to Gmail. It archived the email message as soon as it was sent and inserted a GIF of Bob the Minion, a character from the Despicable Me film series. But it backfired when people were not impressed with the idea. Many complained about sending GIFs on business emails. Searchable Socks: This new product was announced by Google Australia. Called Searchable Socks, it would find the lost pair of socks using the Google app. On tapping the sock, it would play a song. Google Maps Disco: Google Maps featured a video with the Pegman from Street View disco dancing. Google Express Parachutes: Google promised a fast delivery of things you need from the stores. It was a new delivery technology which would deliver your packages anywhere. YouTube SnoopaVision: YouTube launched Snoopavision feature which allowed users to watch users in 360 degrees. The name was given because they roped in Snoop Dogg to feature in these announcements. Self-driving Bike: Google Netherlands announced Google Self-Driving bike inspired by their self-driving cars. They were said to enable safe navigation through the city for Amsterdam residents. Gmail Emoji Smart Reply: Gmail announced about introducing emoji replies and adding more 'sass' to replying. The one-click responses had emojis. Interplanetary app publishing: In its publishing process, a new section was added DISTRIBUTE TO THESE PLANETS, which had a list of all planets in our solar system. In the 'Learn More' tab it added that it gave clarification about being an April Fools' prank. New Chief Compression Officer: Google X announced they had hired Richard Hendricks (from HBO's TV show, Silicon Valley) as their Chief Compression Officer, in order to solve the challenges they were facing. 2017: Google introduced new Pac-Maps to allow users to play Pac-Man. The player was taken to a random spot in the world to continue the game. Google Wind: Google showed an example of controlling the weather locally by announcing a clear weather sky in Holland. They stated "it uses Machine Learning to recognize cloud patterns and orchestrate the network of windmills when rain is approaching. Test results look very promising." Google Japanese Input: The Google Japanese Input had a bubble wrap in its version. There was a bubble wrap at the end of the page. Haptic Helpers: Google claimed it would take virtual reality to the next level by implementing the senses of taste, touch and smell. Once the user tried to sign up, the words became "April Fools!" Google Cloud for Mars: Google took data storage to Mars in this announcement. They said they had created a datacenter on Mars, nicknamed Ziggy Stardust, which would open in 2018. Mobile accessories for Chromebook: Google announced new accessories for Chromebook that are only available for mobile phones. These included Chromebook Groupie Stick, Chromebook Cardboard, and Chromebook Workout Armband, all of which didn't exist in real. Google Gnome: A new Google Assistant product specifically designed for the yard called Google Gnome was introduced. It could also mow the lawn! Google Now for Cats and Dogs: A new 3D action on the Google app would be a special experience for cats or dogs. 2018: On 1st of April, Google Cloud launched a "hummus API" to organize information, even hummus. It attempted to store their favourite information as hummus. Gboard Physical Handwriting Board: The Google Japanese Input team, proposed a physical handwritten version of Gboard. It was developed "to realize intuitive character input". Where's Waldo on Google Maps: Where's Waldo scenes were hidden all over Google Maps. Each scene rewarded the player with a clue for finding the next one. Bad Joke Detector: To delete unncessary files, Google announced it would delete all bad jokes from the user's phone. Googz: Google Australia redesigned for Australian citizens called Googz. They presented results of a survey that about 80% Australians commonly refer to Google as Googz. Recrawl Now: Google Search Console made a site recrawl feature that instead rickrolls the user. 2019: On this year's April Fools' Day, Google introduced the Google Maps Snake game. Mobile game 'snake' has been one of the oldest games and Maps decided to go old-school this year. The user will have to tap on the Play Snake feature and they can choose the destinations on the map to play the game. Google Tulip: Google Netherlands offered a new feature of talking to the famous flower, Tulip. It said due to the great advancements in artificial intelligence, the Google Assistant is now available to talk and understand the flower Tulip. Google Assistant: If the user asks Google Assistant about April Fools' Day, it gives out hilarious pranks. It keeps on giving examples of pranks if you continue asking. Over the years, Google started introducing multiple features on different applications to have fun with more users at a time. This is the list of all the pranks that Google has played on the internet and trolled the users in different parts of the world. Gmail, Google Books, Google Docs, YouTube, Google Voice, Google Assistant are some of the applications which had simultaneous pranks for people on April 1. So this year, if you get a notification or observe something new around these devices, recheck the date and don't end up being a fool. Google's April Fools' Day jokes are quite popular since they have been doing it since years now.